When you travel, especially, breakfast is the most important meal of the day? And when you’re heading into Yosemite, one of the most beautiful national parks in the U.S., you need proper fuel to begin your adventure. That’s why we have created an entire blog that focused on where you can enjoy a delicious breakfast in Yosemite! If the way to your heart is through your stomach, then you’ll not only enjoy eating breakfast in Yosemite, but you’ll also enjoy exploring the many varied restaurants throughout the region. In fact, right here at Hotel Charlotte, we feature a delicious buffet breakfast each morning for our guests. Plus, our restaurant Fork & Love serves delectable dinner options Wednesday through Sunday evenings. Download a copy of our free Vacation Guide for a list of our favorite eateries and our selections for the best things to do and see in the region. There are several options for dining within Yosemite Village. Degnan’s Kitchen offers breakfast favorites, as well as coffee and espresso to get you going! If you enjoy fresh baked goods and donuts, you’ll find them at Degnan’s Kitchen, too. The Village Grill Deck is also open for breakfast. Several restaurants within Half Dome Village offer breakfast items, including Coffee Corner and Mother Curry’s Kitchen. From delicate pastries and rich coffee to heartier, homestyle cooking, you’re sure to find the sustenance you require and find a seat in the open cafeteria-style setting. If you’re looking for a lovely place to splurge on a delicious meal, consider the Majestic Yosemite Dining Room in the heart of Yosemite National Park. The setting is nothing short of breathtaking, with 34-foot high ceilings supported by large pine trestles and grand granite pillars. Reservations are recommended for this fine-dining establishment and breakfast is served between 7 and 10 a.m. seven days a week. Enjoy eggs prepared a variety of ways, as well as sides and specialties. Whether you select Eggs Benedict, Raisin Brioche French Toast, or the daily Breakfast Buffet, you’ll be able to enjoy your meal and marvel at the surrounding natural landscape through floor-to-ceiling windows. If you prefer a self-serve environment and want to sample a variety of foods, consider dining at the Yosemite Valley Lodge Food Court. Housed in the Yosemite Valley Lodge, you have the option of eating breakfast items any time of day you decide to dine. That's perfect for those who get a late start but still enjoy a traditional breakfast. If you prefer to have a hearty breakfast before you make the 30-minute drive to Yosemite National Park, look no further than Hotel Charlotte. Our breakfast buffet features a number of freshly prepared items that will ensure you have the proper nourishment to begin your day. Enjoy fresh fruit, homemade granola, yogurt, cereal, croissants, juice, coffee, and more! Plus, as a guest of Hotel Charlotte, breakfast is included with your stay! Yosemite is one of the most visited national parks in the U.S. For an incredible experience from start to finish, we invite you to stay with us at Hotel Charlotte. 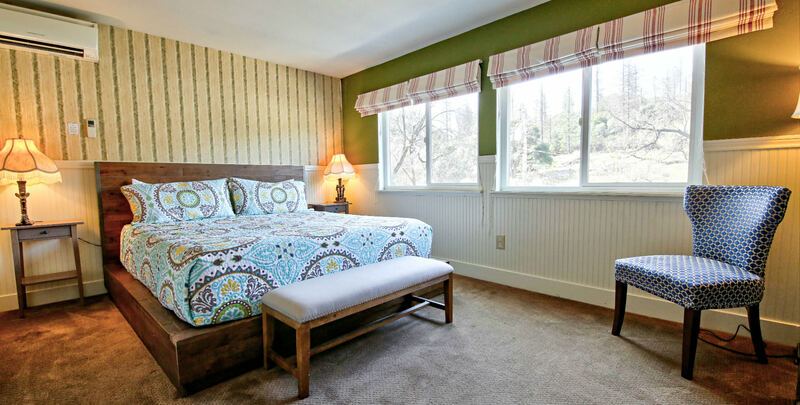 Our family-owned bed and breakfast is a short drive from the park, allowing you easy access to hiking, sightseeing and more. Our location in Groveland also means you are within walking distance of quaint restaurants and shops. Select from our 12 well-appointed rooms at the hotel, or rent one of our cozy vacation rentals, which offer plenty of space if you’re traveling with friends or family. Don’t forget to dine at our Fork and Love Restaurant, which prepares some of the finest and freshest meals you’ve ever tasted. We know you’re ready to start planning your dream vacation, so check our availability and book your stay today!